NASA is set to launch its first Earth science small satellite constellation, which will help improve hurricane intensity, track and storm surge forecasts, on Dec. 12 from Cape Canaveral Air Force Station in Florida. 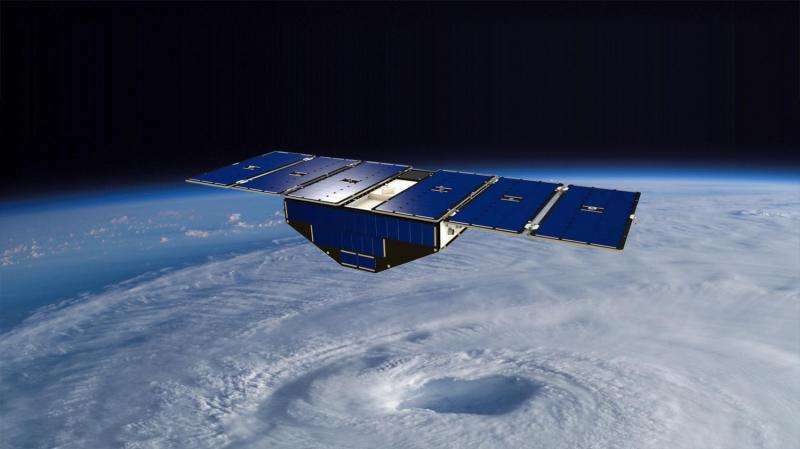 The Cyclone Global Navigation Satellite System (CYGNSS) hurricane mission will measure previously unknown details crucial to accurately understanding the formation and intensity of tropical cyclones and hurricanes. Derek Posselt of NASA's Jet Propulsion Laboratory, Pasadena, California, is the deputy principal investigator. "This is a first-of-its-kind mission," said Thomas Zurbuchen, associate administrator for NASA's Science Mission Directorate at the agency's headquarters in Washington. "As a constellation of eight spacecraft, CYGNSS will do what a single craft can't in terms of measuring surface wind speeds inside hurricanes and tropical cyclones at high time-resolution, to improve our ability to understand and predict how these deadly storms develop." The CYGNSS mission is expected to lead to more accurate weather forecasts of wind speeds and storm surges—the walls of water that do the most damage when hurricanes make landfall. Using the same GPS technology that allows drivers to navigate streets, CYGNSS' constellation of eight microsatellite observatories will measure the surface roughness of the world's oceans. Mission scientists will use the data collected to calculate surface wind speeds, providing a better picture of a storm's strength and intensity. Unlike existing operational weather satellites, CYGNSS can penetrate the heavy rain of a hurricane's eyewall to gather data about a storm's intense inner core. The eyewall is the thick ring of thunderstorm clouds and rain that surrounds the calm eye of a hurricane. The inner core region acts like the engine of the storm by extracting energy from the warm surface water via evaporation into the atmosphere. The latent heat contained in the water vapor is then released into the atmosphere by condensation and precipitation. The intense rain in eyewalls blocks the view of the inner core by conventional satellites, however, preventing scientists from gathering much information about this key region of a developing hurricane. "Today, we can't see what's happening under the rain," said Chris Ruf, professor in the University of Michigan's Department of Climate and Space Sciences and Engineering and principal investigator for the CYGNSS mission. "We can measure the wind outside of the storm cell with present systems. But there's a gap in our knowledge of cyclone processes in the critical eyewall region of the storm—a gap that will be filled by the CYGNSS data. The models try to predict what is happening under the rain, but they are much less accurate without continuous experimental validation." The CYGNSS small satellite observatories will continuously monitor surface winds over the oceans across Earth's tropical hurricane-belt latitudes. Each satellite is capable of capturing four wind measurements per second, adding as much as 32 wind measurements per second for the entire constellation. CYGNSS is the first complete orbital mission competitively selected by NASA's Earth Venture program. Earth Venture focuses on low-cost, rapidly developed, science-driven missions to enhance our understanding of the current state of Earth and its complex, dynamic system and enable continual improvement in the prediction of future changes.